The fighters are Titus Williams who has already won a multiple Golden Gloves Championships and who wants to win one more before turning pro. James Wilkins, an up and coming prospect with killer hands and Nisa Rodriguez who is going for her sixth Championship, something very few fighters, male or female who have ever done. We follow them over the course of the Golden Gloves season as they go on their hopeful march to the finals (perhaps). This is a great film. It is one one of the best films to have played at this year's DOC NYC. It is a you are there portrait of three fighters trying to better themselves not only in the ring but in life. 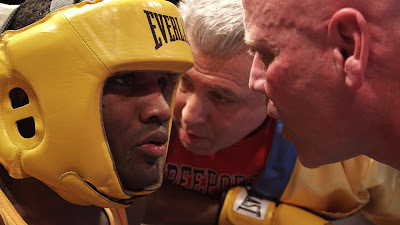 Having been a Golden Gloves fan for years I can assure you that what we see is what it's like. They hold nothing back and we see it all including the struggles many boxers face to do the thing they love. One of the things that I love about the film is it very clear is that despite calls by some to end boxing, the gyms, the tournament and the sport itself are all vital to the survival of many of the fighters. Listening to the people talk about how the various boxing programs have changed the lives of thousands for the better is moving. The sport is not really just about fighting but finding discipline and a family who will help to keep kids and adults off the street and on the straight and narrow. It is a sentiment we see expressed by ex-fighter and trainer Teddy Atlas before one of the cards of boxing. His words were moving and I was touched seeing it play out over the course of the film's 100 minutes. A full confession, this is the second review of the film I've written. Because of the large number of DOC NYC films and how I wrote some of them up three reviews go lost this year. One I found a draft for however two others, CRADLE being one, I've had to go back and rewrite. Before I rewrote the piece I decided to rewatch the film. I needed to take new notes and be more aware of the details of the film. Sitting down to do so I realized just how good the film really is. Freed of the need to have to watch it, retain everything before writing it up and rush on to the next film I found that CRADLE OF CHAMPIONS improved in my eyes as I saw it for what it is a great film. Seeing it a second time I realized that this is a film that I want to see again...and again.... not because I will ever again write on it but because the film is just so damn good. Director Bartle Bull hasn't made a just documentary, he has made a grand narrative. This is a film that is an uplifting film about three people trying to overcome circumstances. Its a narrative that doesn't stand on it's own but mirrors the mythic tales of antiquity that we still listen to because they help us chart our lives. Before seeing the film a second time I as a fan of the film, now upon seeing it a second time I am kind of in awe of it because it is so unexpected in how it's simply telling the tale has made something momentous. Highly recommended, this was and is one of DOC NYC's best films.